Home › Lodging › Cabin Rentals › Old Toccoa Farm. Discover the Difference. Only a 90 minute drive from Atlanta and an easy day’s drive from Florida sits the charming downtown of Blue Ridge, Georgia. The downtown streets are filled with art-centric shops, unique and eclectic product offerings, sweet treats, and a host of new restaurants to satisfy the more discriminating palate. It’s a town that is coming of age and the improvements over the past 5 years have further defined Blue Ridge as Georgia’s favorite mountain town. A short 5 mile drive from historic downtown Blue Ridge, sits the most recent compliment to the Blue Ridge area, a community known as Old Toccoa Farm. Old Toccoa Farm provides the perfect balance understated mountain living, with exceptional mountain views and over 4,300 feet of Toccoa River frontage. The community provides reliable infrastructure including a manned and gated entrance, Blue Ridge city water, high speed internet and sewer rather than septic. The combination of convenience to downtown Blue Ridge coupled with community security, and well planned infrastructure, provides a strong foundation for this growing community. And if that wasn’t enough, Old Toccoa Farm also offers Blue Ridge’s only golf course, a stunning minimalistic Bunker Hill Golf design, with immaculate zoysia turf conditions from tee to the bent grass greens. Having received rave reviews on the current nine holes currently open for play, it’s only a matter of time before Old Toccoa Farm is recognized as one of the premier golf courses in the southeastern United States. And that day could be only nine months away as the developer of Old Toccoa Farm announced on July 4th that construction is now underway to complete the remaining nine holes. Now that several homes are completed, several more under construction, and with road paving under way, there is much to look forward to over the next year. Walking trails along the river, through the valley of ferns, and stops at overlook areas complete with fire pits; it’s one beautiful setting after another. And as you meander through the twists and turns of the trails on the tour, you get an intimate look at the golf course, the incredible turf conditions and the homes that overlook the course. This is a special place where nature stands center stage and charm abounds. It’s an absolutely amazing piece of property! Golf: All you have to do is visit or play the course to recognize this is not just another golf course. This is a course that challenges all golfers, but is also enjoyable to play if you are just getting into the game. The principals of Bunker Hill Golf, who are designing and building the course, understand the game as it was intended to be played. You will not see contrived golf holes or visualize elements that stand out from the natural surroundings. At Old Toccoa Farm, all things are “of the land” and it’s that approach that is so unique. And the reviews on the golf course have been very positive and its growing appeal has earned it a spot on the Georgia Golf Trail. The flow of the golf course is influenced by mountain laurel, massive bunkers, rocky outcroppings, towering hardwoods, and wildflower meadows. As you approach your golf shot on many of the upland holes, you can’t help but pause and look around and notice you are overlooking the breathtaking Chattahoochee and Cherokee National Forests, all a part of the Appalachian Mountains, the oldest mountain range on planet earth. Let that sink in a bit. The history of the area, the inherent beauty of the mountains and the design approach, all working in perfect harmony. More Than Just Golf: Think base-camp for the family. There are plenty of onsite activities, events and programs, and with a seasonal calendar in place for members, it’s up to you to decide what you want to do. Enjoy activities with like-minded people and develop new friendships along the way. Programs such as: Fly Fishing 101 for those just starting out. Group kayaking from Lake Blue Ridge Dam down river to the takeout at Old Toccoa Farm. Photography classes, pottery classes, Nine & Dine couples golf, and traditional member and guest golf events. And if that is not enough, you can work on your craft-making skills by scheduling a class at the world-renowned Oyster Bamboo Fly Rod shop in downtown Blue Ridge or learn how to blacksmith or basket weave at the John C. Campbell Folk School. The opportunities are virtually endless. Get active or slow it down…the choice is always yours. A “Discover Old Toccoa Farm” package is a great way to spend a little more time on the property and offers the best opportunity to discuss real estate options and or membership availability. Get with Managing Partners Peter Knutzen and Kevin Hermetz, or Dallas Storms, Old Toccoa Farm’s Director of Sales, and they will walk you through the product offerings. “Life at Old Toccoa Farm Discovery Packages” are available, providing ample opportunities to experience Old Toccoa Farm in a manner that best suits your needs. 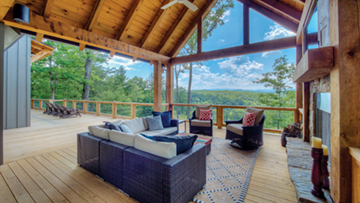 Preview some of the completed homes, homes under construction or available home sites and get a better understanding of what living at Old Toccoa Farm is all about. Don’t just arrive and ask for information, take the tour and see this beautiful community-in-the making, you will not be disappointed. Old Toccoa Farm is a special place, and located only a stone’s throw from the charm of Georgia’s favorite mountain town Blue Ridge, makes it a place you have to visit if you are in the area.